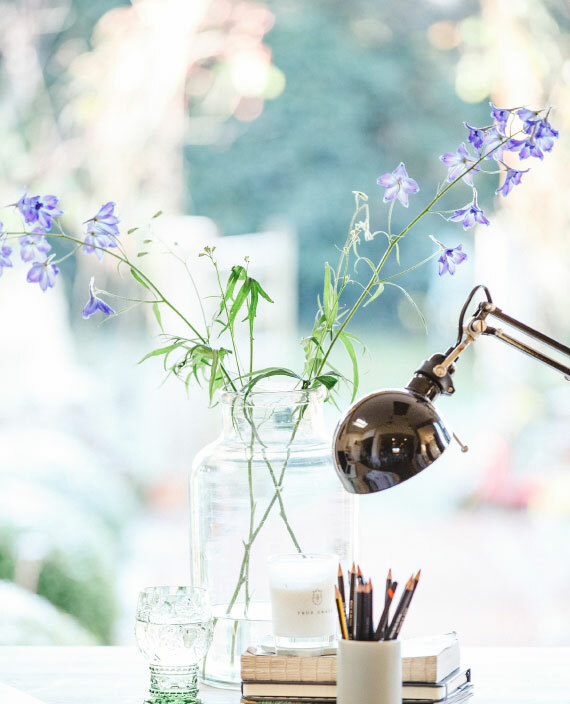 Whether you're an artist, a stylist, a graphic designer, florist or cook it can be sometimes overwhelming to think about what your creative style is. Perhaps you define yourself by what you do: "I paint flowers" or "I cater for weddings and events". This is good, but it can sometimes pose a bit of a challenge when you're trying to either branch out and develop your business; or when you're trying to attract more of the sorts of clients who really inspire you and value your creativity. When you define your creative style it becomes easier to align what you communicate with what you stand for. You can start to only showcase work that really fits with your creative direction and will (perhaps counter-intuitively) start to attract more of the sorts of clients who really value what you do and are prepared to invest in your time. And so rather than saying "I paint flowers" you might think about your approach to design. Emma Bridgewater may have started with a pottery business, but it's through her strong creative style and her awareness of their values that they've created a brand with real traction. Today the Bridgewater brand is now about much more than simply pottery; with stationery, glassware and wallpaper ranges to name just a few, but it's the distinctive style which makes the company's products so appealing. "Writer, cook, broadcaster, florist, gardener and teacher - Sarah Raven is one of life's enviable polymaths. But throughout her multiple talents runs a common thread: whatever you do in life, do it with colour, boldness and bags of gusto." Couldn't have put it better myself! What would or could you say about your approach? Could you sum up your creative style in just three words? For example, one of the florists on our workshop last week defined her creative style as natural, enchanting and meaningful. Those gorgeously evocative words make it so much easier to only show the photography on her website that supports that style; to choose colours and fonts that communicate those words and to decide what to write about on social media. What would your three words be? If you're struggling to think about your creative style succinctly then try this twenty minute brainstorm. Start by thinking about what it is that makes you unique. How are you different from your competitors? By all means consider things like customer service and reliability, but if you're trying to define your creative style you'll need to look closer at your approach to design, what makes you different? What do your clients value about what you do? What inspires you about your work? What projects would you love more of and which briefs give you that sinking feeling? Can you define why that is and what to do about it? Try writing down as many notes as you can think of and you should start to see some clarity. Now can you narrow down your notes to three distinctive words that sum up your creative style? Go on, have a go and do let me know how you get on!